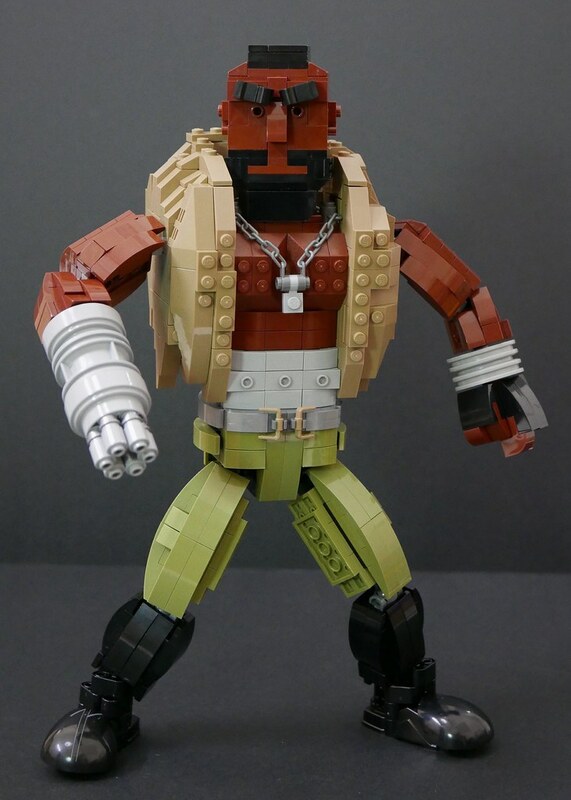 Sharing my latest MOC---- Barret from video game Final Fantasy 7. Barret is one of my faovarite character in Final Fantasy saga. He is the leader of an eco-terrorist group AVALANCHE. His right arm was mangled in the loss of his hometown, and has been replaced with his weapon, the gun-arm, which lets him interchange various weapon attachments to it. Hope you guys like it. Thanks ad BRICK ON! ...Also known as Mister T.
I'm not a fan of the franchise as a whole but I have a soft spot for VII. Anyway, your rendition of Barret is great - the colour scheme is spot-on (although a bit brighter than in the game, I believe), the hulking yet goofy physique is there and the gun-arm is pure genius. However, I think the MOC would benefit from having some sort of white pieces as eyes. Yes the eyes tortured me. It was white piece as eyes in the first place but I want it to be more mature look instead of more cartoon so I change it. And I am thinking to make other characters from FF7, hard to make different eyes from the same white Lego parts so I decided to leave it empty. That's a great MOC. You managed to find a good balance between poseability and sculpting. It looks like half of the pictures are missing. I just add back the missing photos. Seems like editing in Flickr will affect the shring link. Hope you like my MOC. Thanks!